… this is what awaits you at the 67th International Film Festival Mannheim Heidelberg from November 15th to 25th, more precisely visiting your neighbours around the globe in true and authentic, open, forthright, direct and humane dialogue. 55 productions from 38 different countries compete for the ‚Grand Newcomer Award 2018’, including (co-)productions from Albania, Afghanistan, Argentina, Azerbaijan, Australia, Belgium, Brasil, Chile, China, Denmark, Germany, Estonia, Finland, France, Greenland, Italy, Iceland, Iran, Yemen, Canada, Kirghizia, Morocco, Macedonia, Norway, Russia, Sweden, Turkey, Uruguay and the United States of America. 23 of them have not been screened in Germany before. Some of the most surprising formats come from Azerbaijan (a silent movie telling a modern fairy tale about a bra) and from Finland (short films). All of them reveal the origin of their histories: lives and languages, how people relate to each other, to their families, their passions, their homes, their cultures and traditions – and those of the others. This year, there are strikingly many women in the programme, 21 in total. It seems like things are changing in international cinema. 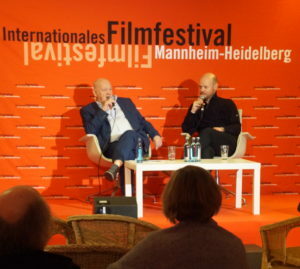 What is special about this festival is the way in which the audience is offered opportunities to interact with production teams and actors – in dialogues about the films. Building Dialogues on Diversity – Towards a Future of Hope.